Love it or hate it, Blizzard's Hearthstone has become the premier digital collectible card game around, and it's still going strong five years after the initial release. Part of keeping a CCG from becoming stale is a regular influx of new cards, and the next expansion was announced earlier today. Called "The Boomsday Project," the new set will be themed around unsafe science projects and will have a particular focus on Mech minions and explosives. If the concept sounds familiar, that's because it sort of is. Hearthstone's very first expansion in 2014 was called Goblins Vs. Gnomes and incorporated many of the same themes. Dr. Boom, who introduces the video above, was one of the standout cards from that earlier set. Five new cards were revealed in an announcement trailer, and more will be revealed as the expansion gets closer to its release on August 7. The Boomsday Project will introduce 135 new cards to Hearthstone, including a new Legendary spell for every class and a couple of new mechanics. The Magnetic ability lets certain cards be played as either a minion or a buff to a Mech minion you already have in play. 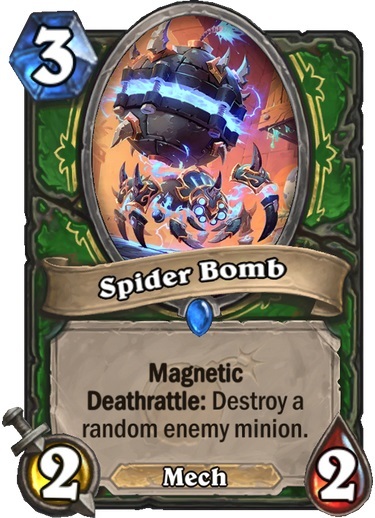 The example shown is called "Spider Bomb," and it's a Hunter card which can be played as a 2/2 Mech by itself that'll blow something else up when it dies. Alternatively, it can be played targeting a Mech already in play, and if this is done it gives the existing creature all of its bonuses, including +2 power and defense. Being grafted onto an existing Mech like this is a tradeoff because it'll make the existing creature more powerful, but also gives your opponent the opportunity to take out two of your cards for the price of one. The other new mechanic doesn't take effect until the endgame when you have a full slate of 10 mana to work with. Cards with the Omega ability will gain additional bonuses if your mana bar is full. 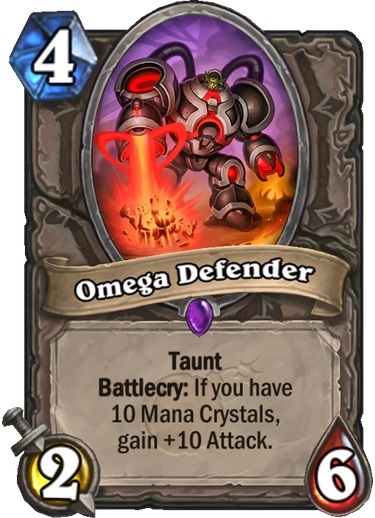 The Omega Defender starts as a reasonable 2/6 with Taunt for four mana. If your hero has 10 mana available, however, the Omega Defender gains +10 attack, becoming powerful enough to trade with some of Hearthstone's nastiest beasts like Tyrantus and Deathwing. The cost to play it doesn't change, so Druids in particular will have added incentive to boost their mana count to the top as quickly as possible. Speaking of which, it looks like they'll have a new tool to do so. It sounds like every class will get a different type of Project spell which benefits both players equally. 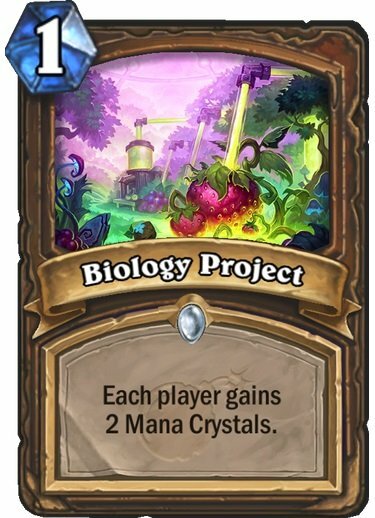 The Biology Project is a Druid card that'll give both players some mana acceleration. When a card like this is played, it'll be a race to see which player can exploit the advantage fastest. While this Druid spell is a common card, the developers also mentioned that each class will be receiving a Legendary spell for the first time. Some classes like Mage have been able to gain a Legendary spell through the Un'Goro quests, but for the most part this is the first time Legendary spells have been added to the game. Only the Rogue's was shown, and it seems like a desperation play. 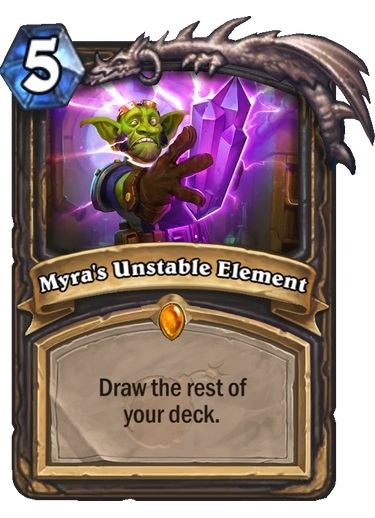 Myra's Unstable Element costs five mana and lets you draw the rest of your deck. Playing it will let you draw up to 10 cards and still have five mana left to play with, but will put you into fatigue and burn any cards that don't fit in your hand. It does have some good synergy with Fal'Dorei Strider, which summons creatures as you work through your deck. But since Rogue already has access to Sprint, one of the best card draw spells in the game, I'm not sure if the Unstable Element will get much play. A few other cards were shown, including a Shaman minion which doubles the effect of the next spell you'll play, and will unfortunately slot quite well into the hated Shudderwock deck. A new Warrior hero replacement was also teased, and while the card's title was legible, none of the effects could be read. 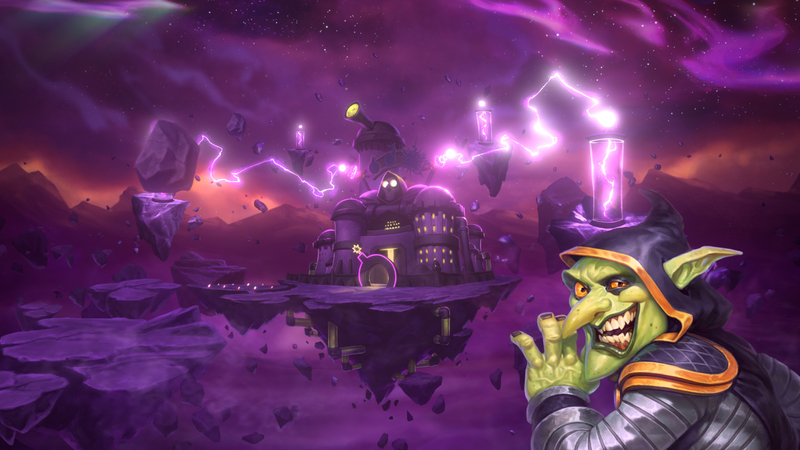 We'll have to wait for more reveals to find out what effect "Dr. Boom, Mad Genius" has when he takes over for Garrosh. A new Warlock hero will also be added, and anyone who preorders the expansion by buying 80 packs before release will be guaranteed a copy of Mecha Jaraxxus in addition to some other cosmetic goodies. 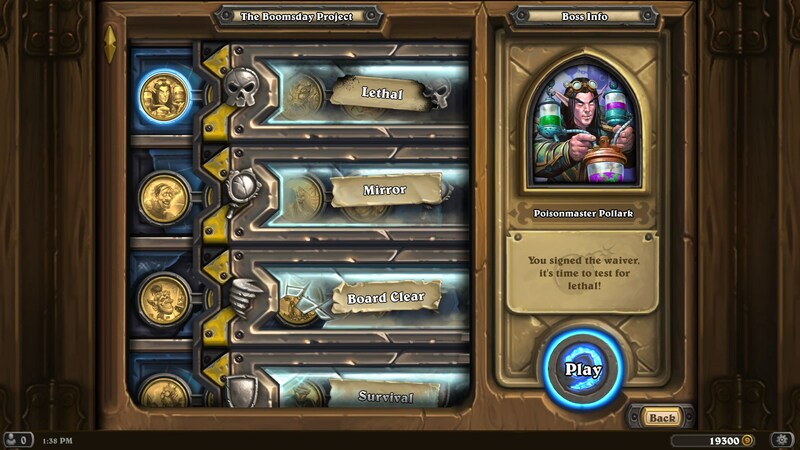 The Boomsday Project will bring with it a new single-player game mode, called "The Puzzle Lab." If the two most recent expansions are anything to go by, this will involve building a deck and challenging somewhat randomized boss characters as you work your way through gauntlet of eight challenges. However, the screen shown looks more like the mode which launched with The Frozen Throne expansion, with non-randomized bosses. 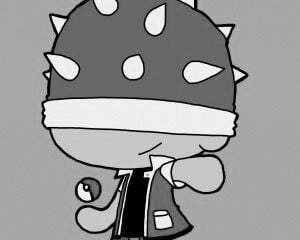 The last two versions have been a lot of fun, but whatever form the Puzzle Lab takes, I hope you'll be able to earn concrete rewards from these challenges rather than random packs. There were some additional changes to existing cards that went live with today's patch, mostly regarding tribal types. Mountain and Molten Giants are now part of the Elemental tribe. Witchwood Piper is now a Demon (a possible slight nerf to Warlocks), and North Sea Kraken and Jungle Moonkin are now considered Beasts. The Midsummer Fire event will return soon, offering double gold for quest rewards and adding some firework-themed cosmetics to the hero portraits.